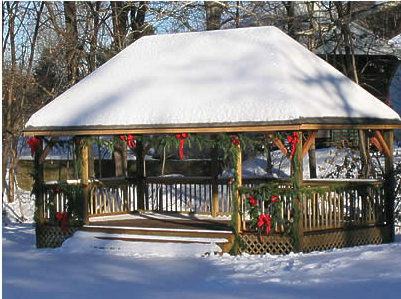 The bandstand, officially named The Carle B. Robbins Jr. Bandstand (pictured here in its winter finery with Christmas decorations, circa December ‘06) was built during the summer and “gifted” to The Durham Township very recently. DHS is exceptionally pleased to have made this contribution to the Township and to have been able to name it after a fellow DHS director who passed in 2005. Carle was one of the better people on this earth and we will miss him mightily. The structure was conceptualized by one of our directors, improved in design by a local builder/artisan, and built with director/volunteer labor and, of course, the clever hands of the contractor who oversaw the process. DHS will use the bandstand for its annual Community Day (usually held on the 2nd Saturday in October), for Durham citizen events as the Township may allow and for other concerts and occasions sponsored by DHS. 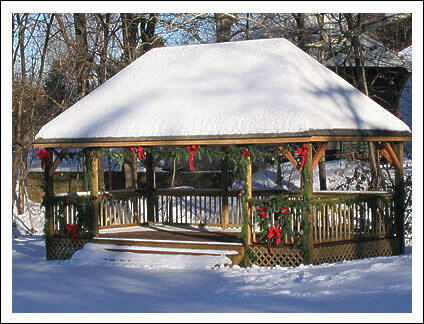 The bandstand can be seen (and we welcome you to visit and enjoy the placid surroundings next to the gentle Cooks Creek) on the Village Green next to the Durham Boat pavilion which is adjacent to the historic gristmill in Durham, Bucks County, Pennsylvania.